Our Gifts of Hope are lovely ways to remember a special person on a special day. Tell the recipient yourself, or ask JustHope to send a card. Browse and order from the online catalog, or view the PDF. Select a program area below to view those specific items. Your browser does not support iframes. See the catalog here. 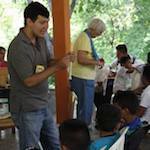 Primary school (through 5th grade) is free in Nicaragua, but students need clothes and supplies. With $50, you provide a child with a backpack stuffed with a uniform (including a belt for boys), shoes and socks, and a notebook and pencil. The recipients are chosen by the community leaders based on family need; only one child per family can receive a scholarship until all families in need have been served. Community leaders follow up with the primary age becados (scholarship recipients). If a child does not complete the school year, that family is not eligible for any of their children to receive a scholarship the following year. $100 is reserved each year to help the student to cover the $500-$800 most schools charge students to receive their diploma. transportation and living expenses - Most students travel from Chacraseca or La Flor to either León or Managua and stay during the week. We also ask that university scholarship donors seriously consider pledging at least two years of support. It doesn't do the student any good to go one year and then be left without sufficient funds. 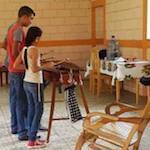 University students are followed and supported by JustHope's Nicaraguan staff by attending required bi-monthly meetings. They must turn in their grades every three months, and tutoring is provided if they fall below a 75% grade point average. Students whose grade point average remains under 75% for two consecutive quarters lose their scholarship. Scholarship students also perform at least 20 hours of community service each month. JustHope distributes resource crates — stocked with reading books, maps, diagrams, math manipulatives, and a STEM kit — to fourteen schools in Chacraseca to supplement learning in the classroom. $20 provides a resource crate for one month; $240 for one year. Teachers in Chacraseca believe the greatest resource they have is themselves. Through the Teacher Enrichment Program, teachers receive supplemental trainings on requested subjects and learn innovative uses of teaching materials. $100 sends a teacher to a week-long teacher enrichment program to improve classroom skills. Chacrasecans of all ages enjoy developing new skills, celebrating their cultural heritage and coming together as a community in the new Cultural Center. Let’s make sure the lights are on to welcome them! $50 provides electricity & water to the cultural center for one month. 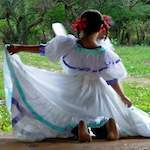 Learning and performing traditional folkloric dance teaches young people about their culture and gives them confidence. $60 outfits a young person with a traditional folkloric dance costume. We believe the cultural center would operate most effectively with a part-time administrator from the community coordinating activities. $210 employs an administrator for one month. A refractometer uses refractive light passing through a plant to determine nutrient levels. This tool will help the Model Farm and nearby farmers assess the health of crops. $300 buys a refractometer for the Model Farm. Educating farmers is an important pillar of the Model Farm & Farmer Field School program. Workshops are provided in two styles: a four-month certification course and individual one-day seminars. $60 gives 6 months of monthly one-day seminars to a community member. Educating farmers is an important pillar of the Model Farm & Farmer Field School program. Workshops are provided in two styles: a four-month certification course and individual one-day seminars. 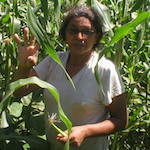 $100 gives one year of certification courses to a farmer.